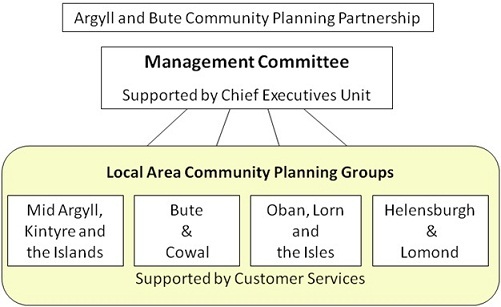 Each of the four administrative areas in Argyll and Bute has an Area Community Planning Group (ACPG). Area Community Planning Groups are local partnerships and are made up of representatives from statutory, private and charity/voluntary sector partners and local communities. There are four ACPGs representing the four administrative areas of Argyll and Bute: Oban, Lorn and the Isles; Mid Argyll, Kintyre and the Islands; Helensburgh and Lomond; and Bute and Cowal. The Area Community Planning Groups were set up to help service providers and community representatives to work together to identify and prioritise local service delivery. They are an important part of the local decision making process and are seen as the way forward in providing better, joined-up services which are responsive to what communities want. Find out what your ACPG is doing in your area. Find out more information about community planning in Argyll and Bute.